Affordable Search Engine Optimisation (SEO) that has got the power to make a huge difference to your business. With our unbeatable packages and our trusted techniques, we can help you meet your ideal audience. In this step as a start towards the goal we will need to establish the ground work. We will first review the site and will prepare a report which will consist of the detailed information as to where the website stands right now, and what needs to be done to fulfil the requirements for SEO and set the expectations. Following are the parameters we will be assessing the website on. The content of the website is the crux of healthy website. The Search Engine boats target the content and the keywords highlighted within the content, and based on that they decide the weightage of any individual page; and hence it is very important for any website to have quality content along with a high density keyword richness. Domain is very crucial for good SEO and most industry experts believe that Domain Aging is very important for "œStability"ÂÂ of the website. It is not an absolutely a "˜must to have' feature but it definitely helps the SEO efforts. Keyword analysis can be important for your company, as these keywords will be the ones which your website will be ranked for. If this step is done incorrectly, not only you will be wasting time but also losing money on keywords which aren't returning the investment. No SEO campaign should be started until you are completely satisfied with the keyword analysis. When it comes to keyword analysis you should ensure that the keywords you choose are competitive and will drive the most traffic to your website. The concept of "page size" is defined as the sum of the file sizes for all the elements that make up a page, including the defining HTML file as well as all embedded objects (e.g., image files with GIF and JPG pictures). This number is the approximate number of pages on your site that have been stored in the various search engine indexes. The web crawler will visit the website periodically and look for new content for its index. Generally, the more pages your site has within the search engine cache, the better. Internal linking is what helps search engines navigate around your website to help crawl all the pages you have. The better your internal linking structure, more likely that you will improve your rankings. There are a number of things you must take in to consideration while applying an internal linking structure to your website, such as the number of times you use an anchor text on your website, the number of links you have coming out of a page and the number of times you link to a particular page. By ensuring that your internal linking doesn't come from spammy will help reduce the chances of being penalized by search engines. Page speed became a signal for improving search engine rankings about a year ago and has since become more important as peoples' demand for faster websites has increased. To ensure that you cover this technique, you must ensure that you spend a little more money on a quality website host and also ensure that your website is created with speed in mind. When it comes to page structure, it is important that you structure each and every page correctly as this will lead to "œperfectly"ÂÂ optimized pages. An example of this would be including your keyword within the content a certain number of times, along with linking to certain pages and using your location, for local search. All of these are a great help when it comes to page structure. Although it is difficult to decide on the exact number of times the keywords be used per page, you can make up simple rules for your company to follow. For example only use 2-3 times within the shorter pages and use 4-6 times within the lager pages, as well as using images, page titles and H1/H2 headers. The first thing you should ensure you optimize is the page title of your website. The most commonly followed way of creating a title is to include your main keyword at the beginning, followed by another keyword of less importance. The Meta description should be unique for each page and should be used to entice searchers to visit your website over other websites in the results. A Meta keyword area is available, but Google as well as other search engines announced that this does nothing to help improve your positioning. Headings are located within the content, starting with an h1 header working down to h6. The h1 is normally the title of the page; the h2 is the sub title, the h3 a sub-sub title, and so on. The more content you have on a page, the more likely you will use more headings. The h1 heading should contain the main keyword you are targeting on a page, this is because it is commonly found at the top of a page which helps search engines identify what a page is about. Alt tags are used on the images you publish around your website to help search engines understand what an image is about. This tag is a great place to insert keywords which are relevant to your page and the content within the page, and can help with your website's SEO rankings. Along with this, Alt tags enable people who cannot see your images to understand what is there. When you are creating an alt tag you should ensure they are short and to the point, usually two or three words should suffice. There is no right or wrong way to use these alt tags other than spamming the alt tags with keywords which are not relevant to the page or the pages content. If this technique is carried out on your site and you are caught you may be penalized by Google and sent down within the search engine rankings. So whatever you are doing, ensure you do it the right way. External linking has been the number one method when it comes to improving your websites rankings for a number of years now. Due to recent algorithm updates by search engines such as Google, getting external links for a website is more challenging as it can have your website penalized. To avoid being penalized, a quality external linking strategy must be implemented over a certain period of time. By being careful with where you get your links from, you can help improve your websites position depending on the quality of your back linking portfolio. Social media is becoming very big nowadays and it is used every day by millions of people worldwide. However, not only is it getting big for personal use, it is also getting big for optimization purposes. If you are not using these social media websites nowadays you are missing out on a very big step which can help to promote your business online. Social media websites that are used by businesses to promote themselves are Facebook, Twitter, LinkedIn, YouTube and Google+. By keeping your social media profiles up to date frequently will help you promote your business online. The most ethical way of getting links to your website is through linkbaiting. Linkbaiting is a method of enticing webmasters to link to your website, through using innovate ideas such as videos, images, games, etc. If it is something people will like, webmasters are more likely to link to it than other websites. By submitting articles around the web you may be able to attract some high quality backlinks. These articles will be posted in portals that are relevant to your industry. Articles can also be used to promote new services and offers your business may have available that customers are unaware of. If your business is accessible by the public, having your location available online is the perfect way to help attract new customers. There are many services available on the web to help get your company on maps, such as Google Places, Yelp, and Bing maps. This services is offered at a standard rate of R5200.00 (plus VAT. ), this is one time fee for the efforts to provide you detailed report about where you website stands right now. The solution is offered based on the predefined efforts we make for agreed time which is described in the Step 3. Please follow the document in order to understand more about the packages. Step 3: What we can do to improve SEO? Search Engine Optimization (SEO) is the method of optimizing a website for chosen keywords/phrases to improve their positioning within the major search engine result pages. This is done by using techniques both onsite and offsite-, techniques which have been researched in depth to ensure they do work. In the SEO industry it is unethical to promise clients that one can guarantee page 1 results. We can, however, assure you that we will implement all the best practices to give your website the highest opportunity to reach that much sought after position for your chosen keywords, no matter what your industry is. Although we desist making promises, we have proven time and time again by looking at the success of our clients, that page 1 is a realistic goal for all companies big and small. *Content Writing services is charged R560.00 per page with maximum of 500 words per page. *Content Writing services is charged R728.00 per article with maximum of 500 words per page. After the core SEO foundation is built, we work with your team to ensure that your site's organic visibility continues to climb. Our monthly SEO reporting helps you monitor the incremental progress as the effects of the SEO work done up front take place in the search engine results. In addition, we typically recommend ongoing monthly SEO maintenance, to build on the solid foundational SEO work done to date. Monitoring and course correction from time to time is the best way to improve your overall search engine ranking. 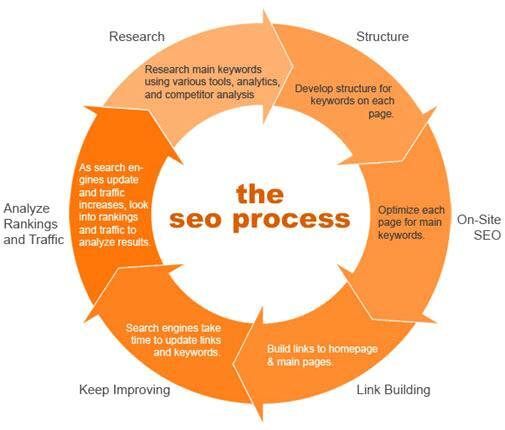 Part of the ongoing SEO strategy is to develop new content that supports the SEO analysis and foundation work. Adding optimized content regularly to the website supports the SEO goals and reinforces the content architecture of the site. We oversee the content implementation, making sure that your Page Level SEO elements are fully optimized. Progress is included in your monthly search engine optimization reporting. Even after we have identified valuable key phrases, it is important to monitor your site's performance, as well as recommend adjustments or additions to the content, coding, or internal linking to enhance the site's relevancy in the search engines. Not only are search engine algorithms undisclosed, they change frequently and without anyone's knowledge. As such, our ongoing SEO management is a process of regular monitoring, analysis and adjustment, all of which is included in your monthly SEO reports. The volatility of the online environment makes portfolio diversification" a good metaphor for SEO management. Like a sound financial plan, an effective SEO strategy minimizes your exposure to systemic risks and moderates the impact of unpredictable algorithmic changes. In a well-conceived SEO management program, your risks of losing site equity are minimized for a relatively minor investment compared to the return you get. Effective SEO Performance Management requires regular monitoring of search engine rankings, traffic volumes and related metrics, and sound SEO reporting. The insights from the data are used to develop and implement supplemental strategies in response to the dynamic organic search environment: algorithm changes, shifts in online competition, website updates, and changes in technology. = Monitor your website's search engine rankings for the agreed upon target key phrases. = Monitor the crawling and indexing activity of key search engines on your website. = Monitor the integrity of sitemap files, URL redirects, and URL formats. = Monitor the performance of your website, particularly page load speed, which can affect your ranking. = Recommend SEO strategies to adapt to evolving search engine algorithms. = Fortify key phrase relevance by suggesting new content and enhancing existing content. = Suggest modifications to any of internal link structures to promote important pages. 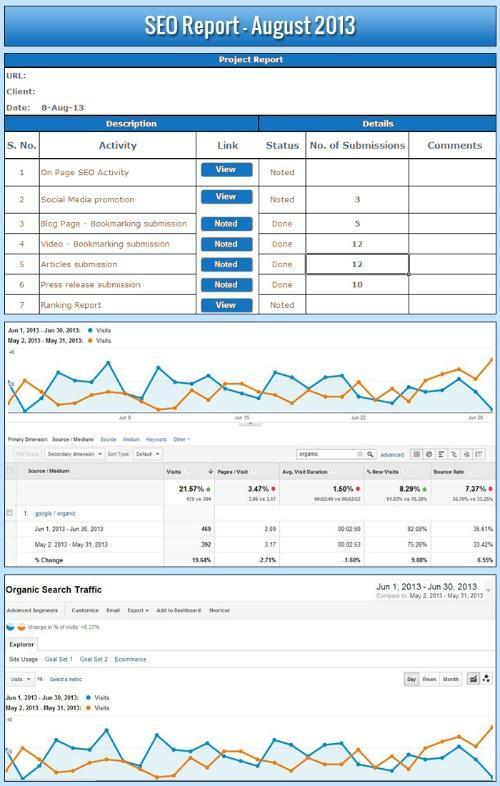 = The information we monitor and recommendations we make are shown on your monthly search engine optimization reports. All of the elements that impact your SEO efforts are rolled up into a single monthly SEO report, allowing you to monitor progress and communicate efforts to other stakeholders within your organization. Here is what a typical monthly SEO report looks like. We show the SEO project goals, progress made this month, and the next steps we recommend. SourcingMachine's SEO expertise can help you unleash your site's potential, whether you're an old hand at Internet Marketing or just getting started. 1) Under our SEO consulting services, we never guarantee the projected results. Google itself says you shouldn't work with any SEO agency that does so because of the evolving nature of the Google search engine algorithm. 2) No one can guarantee a #1 ranking on Google as per Google Guidelines. We will put in years of experience and our exposure to the best practices, to achieve the rankings within the time frame and increase the traffics of the site. 3) Under our SEO service(s) we do not guarantee or promise to promote any sales or traffic to your Web site. 4) Any cost related to writing of SEO friendly content for web pages and development and design work, if required to be done by us, would be charged to you in addition to the SEO Services mentioned above.